Remedial, Education, Performance, WAEC, Science, Student. Education is an essential tool used by governments to address the concerns of economic growth and equity. Aware of the vital role of education to economic growth and development, economists have spent considerable effort examining the determinants of academic achievement. Though most literature have examined the importance of education to economic growth and development, majority have focused on the importance financial resources in determining educational outcomes. Very limited literatures have focused on educational performance. Statistics from both develop and developing countries indicate that a significant number of students are pursuing tertiary (University) education. In spite of this, quite a greater number of students do not readily qualify for tertiary education hence the need for remedial education. Remedial education aims at contributing, supporting and increasing the academic performance of students who do not meet the entry requirements of the various tertiary institutions in the regular examinations. Aside this, remedial schools aims at improving and building the competencies of students who performed poorly in the regular examination. Despite the importance of remedial schools, researchers have paid considerably little attention to remedial programs. Prior research for instance, suggests that remedial schools have positive and significant effects on student learning in the short-run (Mukoko & Mdlongwa, 2014) but the effects are insignificant in the long run. On the contrary, the limited studies on retention or remedial are indications that retention or remedial education decreases the self-esteem, school adjustment and academic achievement (Humphrey et al., 2013) of such students. Since the adoption of the Senior Secondary School (SSS) system in Ghana, remedial institutions have played and continue to play significant roles students’ performance. Remedial institutes help students’ qualify for tertiary by preparing such students to resit the November and December Senior Secondary School Certificate Examinations (SSCE) or West African Secondary School Certificate Examination (WASSCE) examination. Thus, remedial institutes have bridge the gap and closer the barriers to tertiary education, by providing adequate academic tuition. Empirical studies have shown that remedial student in most cases perform even far better on the second attempt than regular students (Mukoko & Mdlongwa, 2014). Some reseachers found that student who failed their reading class in the first grade significantly improved and passed their reading and spelling after taking remedial classes. As emphasized by Huang (2010) remedial institutions serve as clinical teaching grounds by providing diagnostic and recovery stories for students to achieve success in their next resit. Remedial Institutions provide low achievers with protection from lagging behind students who passed their examination in the first attempt. It also gives them enough support which enhances self-esteem and allows remedial students keep up with the progress made by their classmate (Humphrey et al., 2013). Although most private remedial institutions in Ghana offer all the courses taught in the Senior High Schools, this study focuses on elective Science student. More specifically, this study focusses on student offering biology, physics and chemistry subjects. The exclusion of elective mathematics is because elective mathematics is also offered by non-science students. Furthermore, there were limited disaggregated data on elective mathematics and other related subjects hence the use of biology, physics and chemistry subjects. An analysis of whether or not students in the regular senior high schools perform better than students from remedial schools is an issue worth investigating because it help assesses the role of remedial education in students perfromance. A crucial question asked at this stage is: Does remedial science student perform better than regular senior high science student? Based on the research question, the main aim of this study is to conduct a comparative analysis of the performance of regular science students and remedial science students. Additionally, the study seeks to explore the correlation between the performance of remedial and regular science student in elective science subjects. The distinct nature of this study can be seen in the two key contributions it makes to the empirical literature. First, the study compares the trends of failure and passes of the regular and remedial students in the three main elective science subjects. Second, this study contributes to the broader literature on the educational system in Ghana; especially it compares the performance of student who wrote the remedial examinations to those who wrote the regular SSCE or WAEC. In this respect, the correlations analysis was performed. The remainder of the paper is organized as follows. Section 2 discusses the empirical literature. Section 3 details the data used in the empirical analysis. Section 4 reports the empirical results, while the final section provides some concluding remarks. The word “Remedial” is derived from the Latin word “remedialis” which means “healing, curing, and relieving”. When applied to students and educational institution, the term means the need to remedy or correct “specific skill deficit”. The history of remedial education in Ghana dates back to the 1990s when the Senior Secondary School (SSS) systems were introduced by the government to replace the O and A levels education. Remedial education is used by students for correctional purposes and a tool for an improvement on later tests. Remedial educational institutions were set up as private led institutions that operate in the educational sector with the main aims curing or correcting poor performances among students who wrote or have written the regular SSCE or WAEC. Theoretically, there is no single theory to explain the remediation or learning deficiency. General theories such as behaviourism, cognitivism and constructivism prescribe different approaches towards helping low achievers to perform better. This is because every theory has methods that it deems to be appropriate in helping low achievers (Baker, 2008). Learning theories generally revolve around teachers-centered (behaviourism) instruction or student-centered instruction (cognitivism). Behaviourism focusses on changing the observable or measurable behaviour with no attention to students’ mind whilst cognitivism focuses on the human mind and how it operates (Jarrar, 2014). Empirical studies show that remedial education or retention studies semantically suggests a type of teaching which rectifies some deficiency or puts things right. Remedial education suggests some corrective function which makes the teachings clearly different from what the ordinary classroom aims at achieving. In most cases, students in retention or remedial schools perform better in their second attempt in the same examination. Bereiter (1985) indicated that an important aim of remedial education is to teach remedial students at faster rate compare to regular students (mainstream classroom). Thus, if students who have academically fallen behind their peers fail to make faster progress in their remedial learning, they have much difficulty at catching up with their peers. In most cases regular students perform better than remedial student (Bereiter, 1985). According to Huang (2010) the goal of remedial instruction is to provide low-achieving students with more chances to reinforce the basic knowledge in common subjects. This is to help such student meet the minimum academic standard. To do this, it is important for teachers to make efforts to adapt instruction to students’ special need. Accordingly, it can be concluded from Huang (2010) statement that remedial education might not necessary result in better performance. Recently, Mukoko & Mdlongwa (2014) in their study of the performance of mature Zimbabwean high school girls in mathematics shows that these girls performed better after the remediation activities. Their analysis shows that at all levels and in all subjects’ remedial students performed better than regular students. Calucag & Petilos (2012) in their study of Philippines educational system suggest the need for an improvement in remedial mathematics education in the Philippines. The results obtained by Calucag & Petilos (2012) lend itself to some weaknesses of the remedial program in mathematics. Once these weaknesses are identified and addressed, there is probably going to be a positive impact on the academic performances of the students. In a detailed synthesis and evaluation of 93 remedial summer schools, it was concluded that remedial summer programs increase the achievement of students by roughly 0.25 standard deviations. Certain researchers found that retained students scored 0.19 to 0.31 standard deviations below comparable students who had not been retained. The secondary data for this study was obtained from The West African Examination Council (WAEC). The data is an aggregated data of the performance of regular students and private students from the period 2001 to 2016. Since WAEC changed its grading systems in 2007, the data set used from this study spans from 2007 to 2016. Furthermore, for a comparative analysis, the study compares the performance of private and regular students by focusing on the pure science students. Since the entry requirement for public and private Universities in Ghana is C6, it implies that all students who had below C6 failed the WAEC examination. Based on this entry requirement, “A1-C6” is term pass. Any other grade which does not meet the University requirement is therefore term “failure”. The study made use of descriptive method. Means and standard deviations were used to describe the level of performance of students in the WAEC examination. The graphical presentation was also used to examine the trend analysis of the aggregated data gathered from WAEC. In addition, the Pearson correlation analysis was used to analyse and compare the relationship between the performance of the remedial science students and regular science students. All statistical analyses were performed using the R statistical software. Several analyses were conducted but due to the aggregated nature of the data, three main analyses were finally settled on. The analyses presented in the paper are the graphical analysis, the mean difference between the performance of the regular and private science student, and the correlation analysis. The first analysis compares the failure rate between the regular students and the private students for each of the elective science subjects. In Chemistry, the analysis shows that in 2008, the regular students recorded higher failures that private students. Similarly, in 2008 private students performed better than regular students in chemistry. On the contrary, Figure 1 shows that private students had a higher failure in the year 2013 compared to the regular students whilst the least failure among the regular student was recorded in 2016. The Chemistry results (both passes and failure) shows that on average regular student passed more than private WAEC students and also performed less poorly (high failure rates) than the private students. Furthermore, Figure 2 shows the performance of both private and public students in Physics. Figure 2 shows that private students performed poorly compared to regular students. The best performance (percentage passes) by the regular students was recorded in 2011 and the best performance by the private students was recorded in 2008. Similar to the Chemistry results, the regular students were found to perform better (more passes and less failure) than the private students. More importantly, between the year 2007 and 2009, the graph shows that there was very little significant difference between the performance of private and regular students who took the WAEC examination. After 2009, the gap in the performance (failure and passes) between regular and regular science students widen with most with most regular student performing far better than private student. Unlike the performances in both chemistry and physics, there was a wide gap between the performance of regular students and private students in Biology. 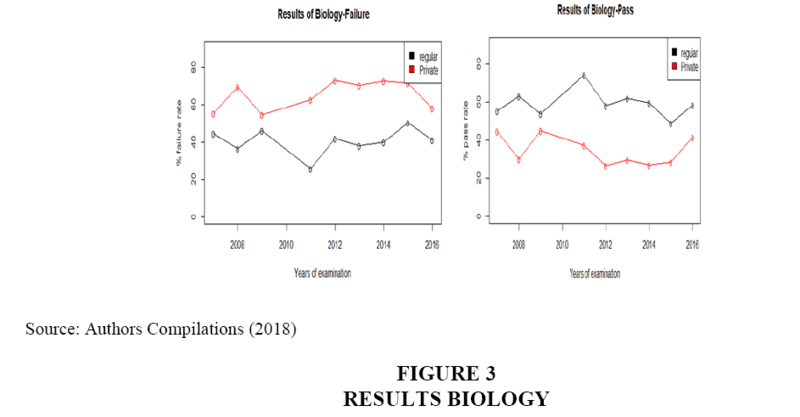 The results of the performances show that private student recorded more failure in biology than private students whilst the more regular student passed in biology than private student for all the years considered in this research. From all indications, regular students performed better than private students in all the elective science subjects. Since the graphical analysis might not be a true reflection of the performance of the students in the examination and also to confirm the graphical, the mean differences were between the performances (passes and failure) of the regular and private science students was compared. The comparison shows that for the three elective science subjects considered regular students recorded higher mean passes than private students, thus Table 1 shows that on average regular students recorded higher pass rate than private students. From these three elective subjects, most regular students performed best in biology, followed by physics and chemistry. On the other hand, most private student performed best in physics, followed by biology then chemistry. The difference between the means therefore implies that on average regular students are better at biology whilst private students are better at physics. In addition, the least passed subject for both regular and private students is chemistry. The finding also shows that the mean differences between the performance of regular and private students is a significant of at one present level. Similar analysis was performed using the failure results and presented in Table 2. Table 2 shows that relative to regular student, private student failed more than regular students in Chemistry, Physics and Biology. On average Chemistry was the subject that both regular and private student performed poorly. 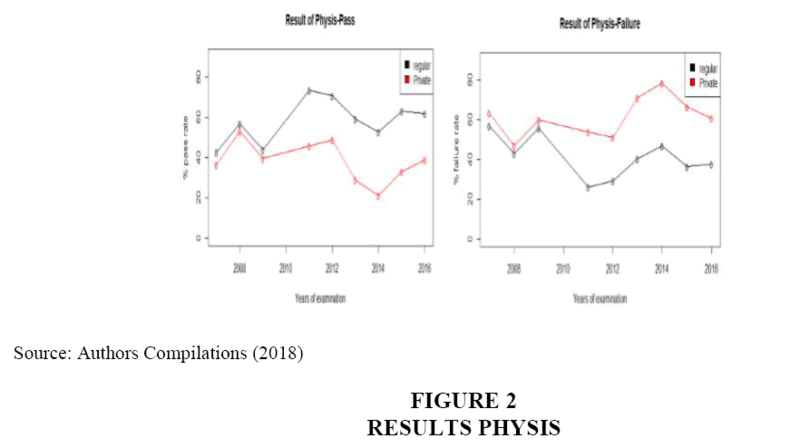 The analysis shows that the second poorly performed subject by regular student was Physics which contradict the findings on the failure rates of private students, which indicated that biology was rated as the second poorly performed subject by private student. Furthermore, Physics was the third poorly performed subject by regular students while Biology was poorly performed by private students. The results of the analysis on the passes and failures of both the private regular students and presented in Tables 1 and 2 generally shows that regular student and private student systematically perform differently in the elective science subjects. Thus, there is a significant difference between the performance of regular students and private students who wrote the WACE examination in Ghana between the period 2007 and 2016. Another important aspect of the study was to analyse the performance of students who undertook the examination. The analysis was conducted by examining the relationship between passes and failure for regular and private students. The analysis begins with the correlation results of the performance of private science students. Table 3 presents the results of the correlation analysis on the performance of Private students in the WAEC examinations. The findings on the performance of regular science students shows both positive and negative relationship between pass rate (failure rate) and results in pass rate (failure rate) of the three subjects. 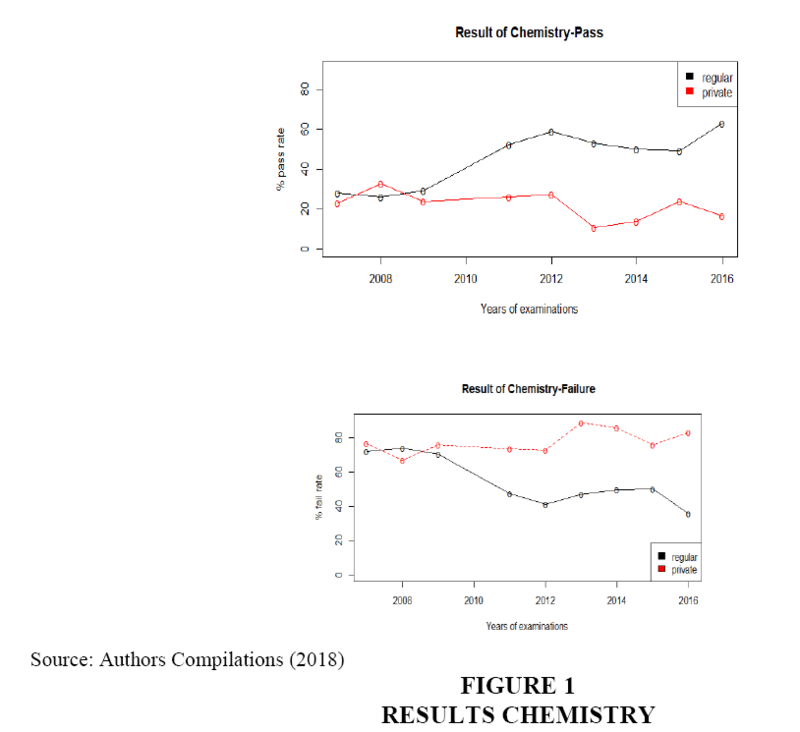 The results show that there was a strong positive relationship between the pass rate of physics and chemistry (0.857) while there was a weak relationship between Biology and Chemistry (0.052). Additionally, the relationship between Physis and biology was positive but weak (0.131). As expected, the results of the study show that there is a negative relationship between the pass rates and the failure rates. For instance, an increase in the pass rate of chemistry a strong fall in the failure rate in Physics (0.860). Additionally, the increase in the performance of chemistry leads to a weak decrease in the performance of biology (0.046). The analysis presented in Table 3 also shows that there is a strong positive relationship between the failure rates in chemistry and Physics (0.853), weak positive relationship between chemistry and biology (0.051) and physics and biology (0.129). In addition, Table 4 shows that there is a strong positive relationship between the failure rates of chemistry and Physics (0.729) and a weak positive relationship between chemistry and biology (0.175) and a medium to strong positive relationship between Physics and biology (0.497). As expected there was a negative relationship between the pass rate and the failure rates of student in the three subjects. Similar to the performance of private students, there was a negative relationship between the performance of chemistry and Physics, chemistry and biology, and Physics and biology. An important issue identified in this paper was that regular student qualifies or meets the university requirements compared to the private students. This finding confirms an earlier study by Bereiter (1985) which indicated that regular education (mainstream classroom) students performed better than retention or remedial or private students. A probable reason for this result could be that remedial students have very limited time to write the examinations hence the teachers have limited time to teach the whole syllabus for the students to pass the examination and qualify for the university. As argued by Bereiter (1985) remedial education is to teach as faster rate than regular education (mainstream classroom), hence the difficulty of the remedial students performing better than the mainstream students. On the contrary in 2008, the findings show that remedial chemistry study performed better than regular student. This finding confirms earlier empirical studies which indicated that remedial education or retention studies rectifies some deficiency or puts things right among students. Hence in some cases remedial students perform better than regular students. Additionally, the findings of this study lend itself to the fact that there is some significant difference between the performances of the regular student and remedial students with the remedial students recording lower mean performances than the regular students. This is a suggestion that remedial education and teachings needs further improvements. This finding is confirmed by Calucag & Petilos (2002) whose data shows some weaknesses of the remedial program in the Philippines which need to be identified and addressed. For the science subjects’ remedial education might be challenging especially in situations where there is no science laboratory for the student to undertake the practical experiments before the actual WAEC examinations. The paper compared the performance of regular and private student who write the Senior High School certificate examinations. Specifically, the paper focuses on the four elective Science subjects. Using the aggregated data from 2007 and 2016, the paper concludes that regular students perform better in all the elective science subjects for the period under consideration. The only exception was in 2008, where private student performed better than regular students. The paper also concludes that there are significant differences between the performances (passes and failures) of regular and private students in the WAEC examination. In the case of both regular and private students, higher passes in an elective subject results in higher passes in the other elective subjects while passes in an elective subject results in a lower failure rate in the other subjects. The paper largely confirmed the cognitive theory of learning and that training the human mind very important towards helping remediate these students. Based on these conclusions, the paper recommends that operators of remedial institutions should provide the necessary science equipment (laboratory equipment) needed to help remedial students perform better in the NOV/DEC examination. Since teachers play an important role in remedial science students’ passing their examination is it important to ensure that competent teachers are employed to teach the science subjects. Baker, P. (2008). Re-evaluating a method of learning design. Innovation in Education and Teaching International, 45(2), 127-142. Bereiter, C. (1985). The changing face of educational disadvantagement. Phi Delia Kappan, 66(8), 538-541. Calucag, L.S. & Petilos, G.P. (2012). The effects of remedial mathematics in learning college. Journal of Education and Practice, 3(12), 131-135. Humphrey, N., Lendrum, A., Barlow, A., Wigelsworth, M. & Sqires, G. (2013). Achievement for All: Improving psychosocial outcomes for students with special educational needs and disabilities. Research in Developmental Disabilities, 34(4). 1210-1225. Jarrar, E.T. (2014). The Impact of Remedial Classes on the Performance of the Fourth Grade Low Achievers in English in Public Schols in Ramallah District. Nablus, Patestine: An-Najah National University. Mukoko, M. & Mdlongwa, P. (2014). A study to investigate the effectiveness of the performance lag address programme in improving students’ performance in mathematics: A case study of students at mutare girls’ high school in Zimbabwe . IOSR Journal of Research & Methods in Education (IOSR-JRME), 4(4), 42-55.